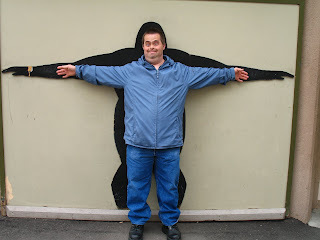 While my parents were on their annual “After-Tax-Season Trip” (My dad is a CPA), we stayed at their house with my brother William (who has Down Syndrome). We had quite the experience with him – he definitely has a unique personality! Most days were great, although he had a few moments of “William” behavior! 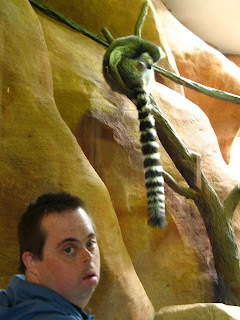 William liked that the lemur was so close to the cage. He's almost as tall and almost as wide as a gorilla! 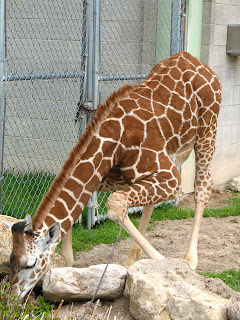 Will's handle in high school was 'Giraffe' - he liked watching the baby eat. 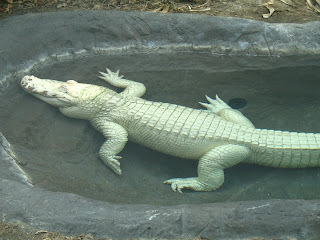 Apparently the “Ghost of the Bayou” is not an albino, but an actual species of Alligator that is white. 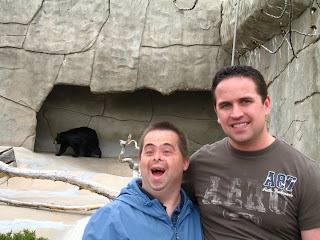 He thought it was quite entertaining when two of the black bears were having a wrestling match. He thought they were fighting – it took us awhile to convince him they were just playing with each other. We are glad to be back at home now, but we did have an overall pleasant time with our “Chilly Willy.” Thanks bud, for making it fun! Gotta love William! That picture of him next to the gorilla shadow made me laugh so hard. Besides his arms not being long enough, he is about the same size as that gorilla :). Hey, where did your baby count down go. I don't see it? Everyone's going to the zoo these days! Glad you had a great time! We feel so left out. How about a visit to the San Francisco zoo?! Miss ya! Sorry I leave so many comments. But where are your profile shots? Let's see the hot mama! Dude! That was crazy. I just went back to my blog and you left a comment. Saweet! So I'm excited that you left the quilt in my hands. I would apriciate some color swatches or something if you don't mind. Just so I have options open. I'm not sure about lunch. I know I know, I miss you. I'm probably coming in sometime next week. I'll call you. :) Do you watch so you think you can dance? Hey it's me again. I can help you with bumpers. That would be so much fun. So did you like the whitie tighty red head? I threw up a little bit in my mouth just thinking of it again. Blah! So the two times that I was and am going to be in town, there's not really a time where I can meet you for lunch. Sniff sniff. Is it ok if we try again next week. Also, I'm proud of Phil. He rides his bike to the bus stop, takes the bus to SLC, get's on trax, from there rides his bike to 24 hour fittness in Sandy, then rides his bike to work. How cool is that? Anyway, I hope you can forgive me for this week. My mom still has both kittens but one is spoken for. The one that's on by blog is the one that isn't spoken for. They are so cute. They always hang out under those bushes. Maybe if you show Neil the picture then it will melt his heart. Tee hee. If you are wanted it that is. So how have you been. I feel like I haven't talked to you forever. 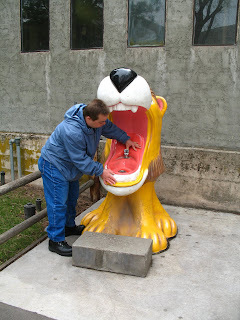 I should probably just send you an email since this is turing into a long message that has nothing to do with the Zoo. My visiting teaching kits are doing awesome. Check my Hand Picked Daisy blog to see my June one's. I felt pround when I finished them. I think this my really turn out to be something big. I hope so. That would be so cool. Oh, also Amber is going to be on Good Things Utah tomorrow morning. You should record it and watch it. She's giving each of the ladies and charm thingy and I made the thing that's in the charm. Cool huh? I get to watch the shop tomorrow while she's there. Well, I hope your feeling well. Hope those green olives are holding up. Miss you guys. Need to go up the hill by our house and camp out. Love ya!